Enjoy quiet time in a centuries-old cottage near Porto and the ocean. Enjoy quiet time in a centuries-old cottage 25km from Porto and minutes from the ocean. The antique furnished 10-room house sits in 6 acres of walled land. It hosts 4 guests in the two bedrooms. We can set up an additional cot in the office, which will have access to the third bathroom. We can accommodate a young child in a crib. We offer all contemporary amenities and a bounty of space to spare. Each stay includes a basket of seasonal vegetables, fruits and eggs from our farm next door. Casa da Mineira is a airy 160 m2 or 1600sf house that sits in a 6-acre walled property. The grounds include a garden, lawn, granite patio and areas of orchard and cultivated fields. 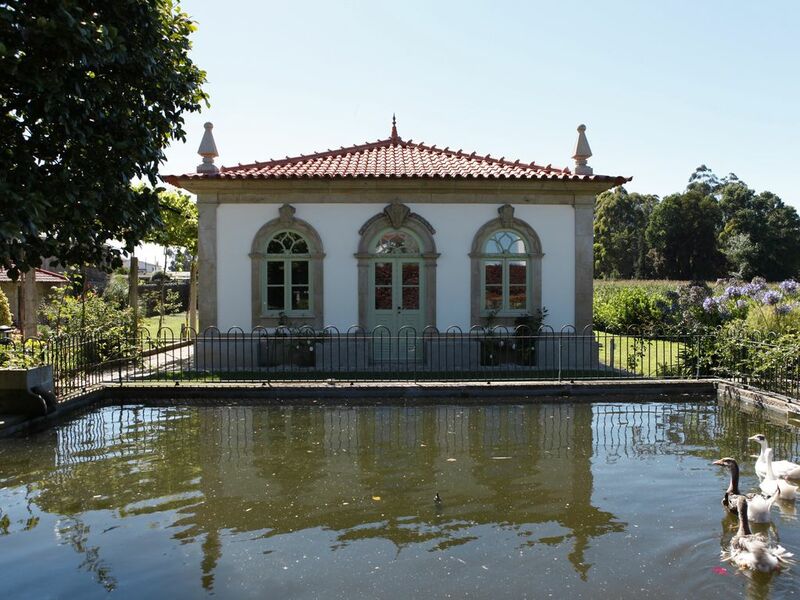 The grounds are part of a large 300-acre farm called Quinta de Vilarinho which has been in the family for many generations. The present configuration of the farm compound, with its mansion, barns and stables dates from the mid 19th century. The house has 2 large bedrooms with private bathrooms, an additional bathroom for visitors, a large and well equipped traditional kitchen, office, TV-room, living room and dinning room. The building was completely restored in the last year to offer all the comforts expected in a contemporary home. It has radiant-heated floors powered by solar-panels, cable TV, wi-fi, dishwasher and laundry washer. The traditional kitchen features an large walk-in chimney with a functional brick oven, a semi-professional stove, full refrigerator and freezer and is fully equipped to cook a feast. The formal dinning room sits six guests. It can very comfortably host 4 guests for a relaxing vacation, but it can also be the ideal workspace for a writer or scholar in a longer stay. Beautiful house in 6-acre private grounds. All yours. Perfect location to make day-trips to Porto, the Douro wine region, a variety of cities on the North of Portugal . You can also visit the main destinations in Galicia like Santiago de Compostela or La Coruña. Beautiful sandy beaches in Mindelo and Labruge, or traditional fishing village Vila Chã within 15 minutes drive. We will offer a basket of seasonal vegetables, fruit and eggs produced in our 200-acre farm next door. Floor radiant heat, solar powered. Drying rack in laundry room. Traditional brick oven in the kitchen. Full refrigerator with large freezer. A lovely, peaceful and warm house. We spent a very enjoyable 4 weeks at the property. Everything needed is provided. The location is very good for visiting the region. Our favorit was Villa Do Conde, for walking on the promenade. The bedding and towels were freshly laundered every week. We very much hope to return. Obregardo Ines. Obregardo Emelia. I would recommend this property to anyone. You will probably need a car for sightseeing, but we used the Uber Taxis and it worked out a lot cheaper than hiring a car. The house has 3 very modern bathrooms and the rest older style, with shutters on all windows. a wonderful duck pond in front, I got to know our feathered friends very well. We visited the restaurant in the square which was very good value. Quite a lot of fish and mainly pork dishes. There is a cafe around the back of the house which is very good and serves you many extras to try, great hospitality and wine. The owner of the property kindly let us stay until early evening for a late flight back and took us into Porto. We hope to return soon. Thank you so much Linda, it was a pleasure to meet you and we look forward to your next stay. The house and surrounding gardens are beautiful,and roomy. Made us want to just stay put and enjoy the quiet. We followed our hostesses' suggestion and went to a nearby restaurant which was excellent. We wish we had arranged for a longer visit. Two days was not enogh. We thoroughly enjoyed our stay. You provided a magical landscape for us to be enchanted and to be recharged. Thank you! We arrived to find a basket of fresh veggies, fresh floral bouquets and a spotlessly clean and beautifully appointed home. With ceiling molding, traditional Portuguese windows and granite restored to the original 200 plus year old home plus modern conveniences made for added beauty and comfort. The ducks greeted our comings and goings and we in turn fed them fresh greens (which they loved.) The location on the village square allowed us to walk to local restaurants/cafes, pubs, bakeries and the like. We were a short drive to the ocean (Vila do Conde) and enjoyed many a walk along the coast. A river cruise on the Duoro, a port wine tour across from Oporto were a couple of offerings easily accessible from Macieira da Maia. Always we were delighted to return to our Casa to be rejuvenated--be that to enjoy wine on the porch, conversation in the living room, a walk on the property, snacks/meals or a nap! Thanks for your review. If your stay was Perfect and Excellent then why not a 5-star grade?